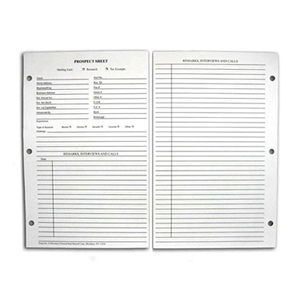 Stockbroker Prospect Sheets, 9.5" x 6"
3-hole punched to fit into 9.5" x 6" ring binder. Plenty of space and nicely ruled to record prospect's name, address, investing experience, annual income, net worth and investment holdings. Columns for remarks and keeping track of phone calls.